This page - like the rest of this site - is in a continuous process of ever lasting construction. 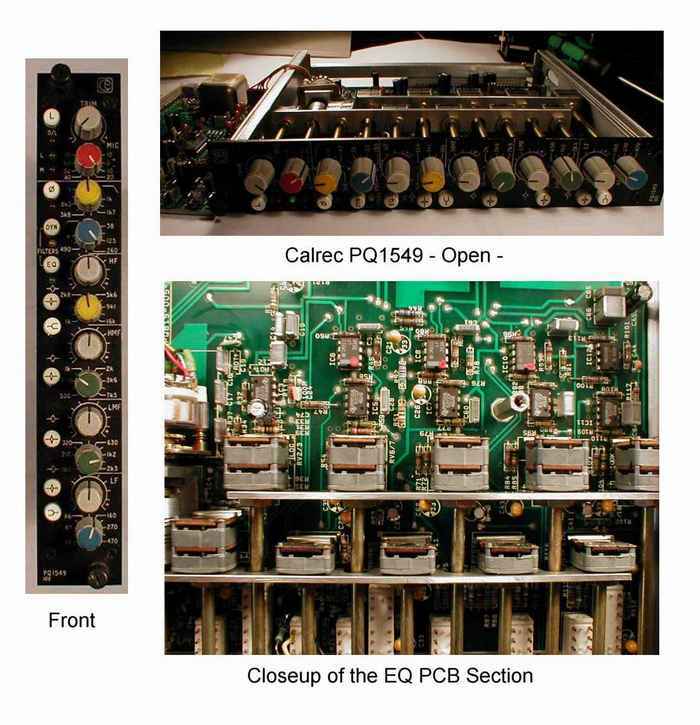 This pages contain information about building your own version of the Calrec PQ1549 Equalizer, the one found in the Calrec "Polar" desk. This EQ is one of my absolute favorites when it comes to standard IC-based types, so I made this project to make it possible for more people to experience these qualities. I will try to update this page reguarly if anyone shows interest in its topics. Comments and corrections are welcome, but I can't promise to reply to all mail. If you do this project and describe the process on your webpage, I'll be more than happy to add a link here, so others can benefit from your experiences. Notice that all information, schematics, layouts etc. are supplied "as is", and that we can in no way be held responsible for its acurateness, functionality or even safety. Gyraf Audio shall not be responsible and disclaims all liability for any loss, liability, damage (whether direct or consequential) or expense of any nature whatsoever which may be suffered as a result of or which may be attributable, directly or indirectly, to the use of or reliance upon any information, links or service provided through this website. Also you should take extreme caution when working with mains voltages. These voltages are lethal, and the smallest error will be chatastrophic. And we like you to stay alive and well, so you can help other people sharing our bizarre interest for building retro-pro-audio-equipment. - NEVER work with live voltage switched on. Switch off, discharge, work, connect measuring equipment and power up. - Always keep your mains connector in plain sight when working, so you can assure yourself that it really is disconnected. - Always tidy up your working area before connecting your project to the mains. This gives you some time for second thoughts about what you are doing. 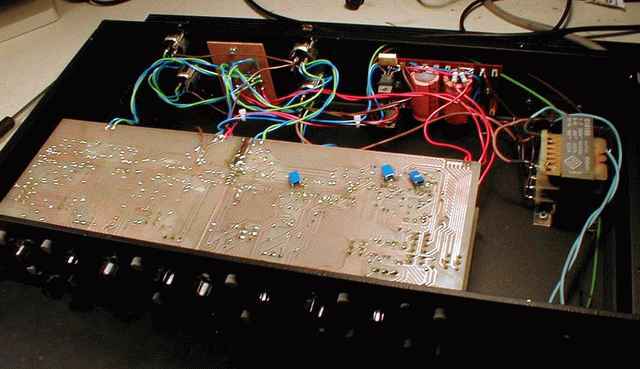 The Calrec PQ1549 is a classic no-nonsense parametric equalizer from the famous (and huge!) Calrec "Polar" desk, that were only manufactured in very small numbers. I believe that there's less than 15 desks like this left worldwide. This is an adaption of the original Calrec PQ1549 module to components and parts that are available (hopefully) everywhere. Adaption includes removal of the mic preamp, filters and switching, changing to newer and even better opamps, adding electronically balanced input and output and a hardwired bypass switch. No doubt that some of you would have liked the Micamp and all, but these imply quite a few not-so-easy-to-get components. So I'm going for the raw EQ section. 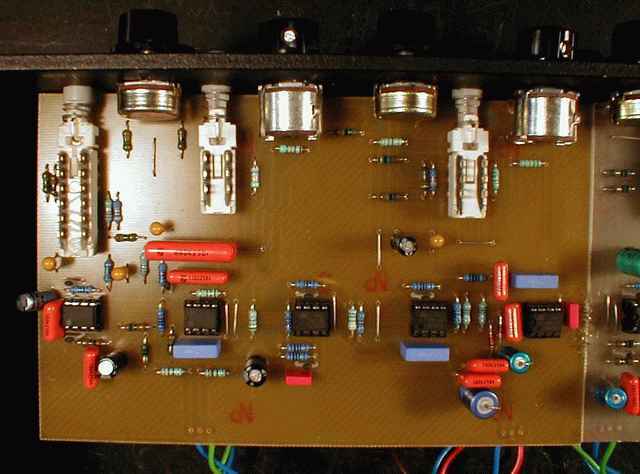 Looking on the redrawn schematic, we first have a standard debalancing input buffer, converting our balanced input signal to unbalanced, and feeding a series of four amplifiers connected one to each' own filter section, and finally balanced again for the output. The four inverting add/subtract amplifiers - working in series - has the filters' inputs connected to either the stage input (at max. boost) or to the inverted stage output (at max cut). Keeping in mind, that the output from each stage is a inverted replica of the input, it's easy to see that when the dB+/- pots are in their centre positions, the normal and inverted signals cancels out, and no signal is applied to the filter section input. The output from the filter sections are added in with the inverting inputs of the amplifier stages, effectively boosting or cutting any frequency that the filter sectionlets through. The four filter stages are - more or less - standard state variable filters. Their frequency is controlled by a 2x100K negative logaritmic potentiometer, which is the only "hard to get" component in this design. 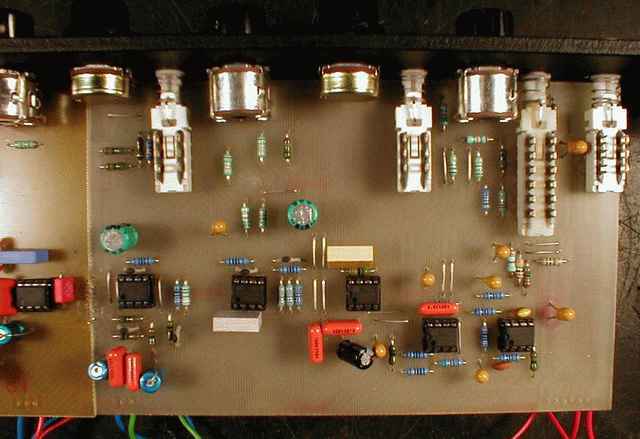 The "Q" factor is switchable high or low, the switching also controlling filter gain to acheive a constant gain-versus-Q. The "Shelving" switches on the low and high end also bypasses the "Q" switch. The PCB set for the PQ1549 consists of two 100x160mm "eurocard" pcb's, that are interconnected. 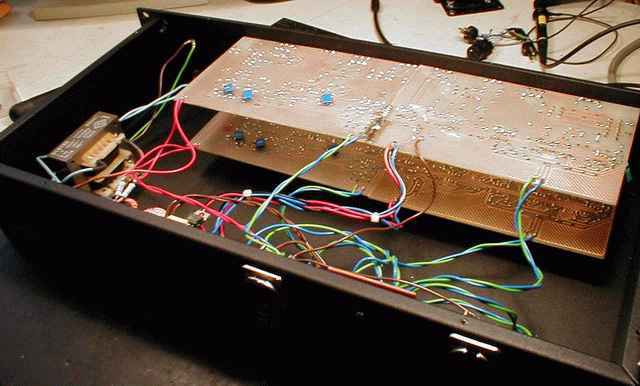 The PCB's are single-sided, and carry all switches and pots, limiting wireing to input, output and PSU. Note, that a +/-18V, ~100mA power supply is needed, and not included here. If it seems that there's a need for it, I will do a pcb for that also.. The artwork files are in PDF format to maintain scale. Please note that the PCB (copper) side is drawn MIRROR'ED - enabling closer printout-to-photoresist contact when making the PCB. If in doubt, use the text on the board as reference. The PCB Layout for the two 10x16cm pcb boards needed (604KB PDF-file). Rightclick the link and select "save as.."
Small PSU for this EQ Small psu for +/-15V or +/-18V. (300KB PDF-file). Use a 2x15V transformer and 7815/7915 for +/-15V or a 2x18V transformer and 7818/7918 for +/-18V. This should be able to drive about four EQ's with a 30 VA transformer. Well, every project seems to have it's own problematic part. In this case, it's the 2x100kC (dual, negative logaritmic) potentiometers for the frequency adjustment. 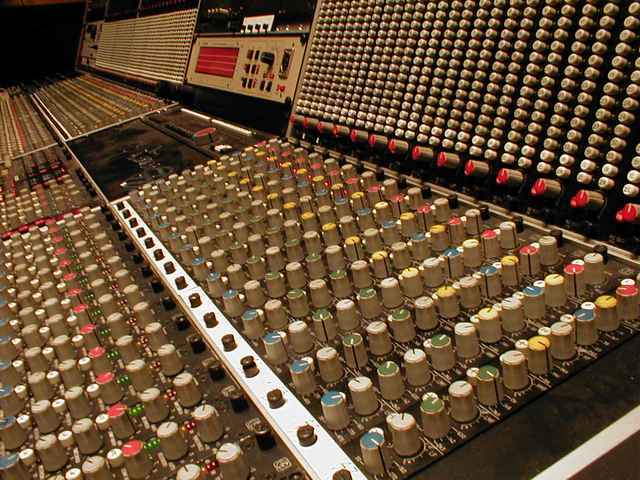 The negative logaritmic scale is needed to get an even distribution of the frequencies when turning the knobs. A dual linear COULD work, but will give unevenly distributed frequencies, making it harder to set the EQ correctly on the lower end of the scale. The 2x100kc pots are widely used for frequency selection in parametric equalizers, so the easiest way to get hold on them would be to buy them as spare parts for some existing device. E.G. TC electronic uses them in their 1140 parametrics, and they are good at supplying spare parts worldwide. If you have access to "Monacor", they have a 2x100kc pot as a sparepart for their PMX600 desk (pos. "VR106"), at a very good price. You take a standard 2x100K log pot, of the type where the two tracks are facing each other - that is, the wiper of the pots are in the center, between the two carbon tracks. It has to be this kind of pots, and it's naturally also imperative that it is a type that can be taken apart and assembled again.. This kind of pots consist of a log section and a neg.log. section.. When you take this apart and change the position of the two tracks, so the back one goes to the front and vice versa, they will now act like a neg.log. potentiometer. We did this in the good old days, before we could afford having pots built to specs..
Magnus' Beginner's guide to the Calrec Equalizer.. ..Including an explanation of how to rebuild stereo log. pots to stereo neg.log..! If you let me know how you're managing this project - and if you have information that could interest other diy-people - I could link to it, or put it on this page.